In February, most people go to places like Aruba. Me, I go to Topeka, where each year the Kansas Silent Film Festival takes place over two days i the dead of winter at Washburn University. And that's where I am right now. This year, it's Friday, Feb. 28 (hey, that's today!) and Saturday, March 1. On the bill are a wide range of films, all shown with live accompaniment, and most of which I've never seen before. And that's unusual, because one of the things that's a little different about this festival is that it doesn't focus on "rare" or "unusual" films or prints. Rather, the pattern in Kansas has been to give audiences a chance to see some of the more mainstream classics in the way they were intended to be experienced: on film (in this case, 16mm), on the big screen, with live music, and as part of a large audience. That last part (the live audience) is key. Because the Kansas Silent Film Festival is free and open to the public, the screenings tend to attract a fairly heavy turnout of local folks who aren't necessarily vintage film fanatics, but just looking for a good night out. And so attendance can be immense: 500 people or sometimes more, depending on the vagaries of the weather and what else might be going on in town. Inside the White Concert Hall at Washburn University, home of the Kansas Silent Film Festival. And that allows all of us, vintage film freaks included, to experience something that was an essential part of the early cinema experience, but which is devilishly difficult to accomplish today: the reaction of a large group of "just plain folks" to an art form that was once part of pop culture, but is no more. And it really makes a difference. It's one thing to chuckle along with other film folks at Charley Chase in 'Limousine Love' (1928) or Max Davidson in 'Pass the Gravy' (1927). But it's something else again to be part of a large crowd absolutely rollicking with laughter at these very same films. It no less than restores to them the power they once had (and still do have) and provides the necessary context to understand why people first fell in love with the movies. I've been interested in cinema of the silent era since I was a kid buying 8mm prints out of the Blackhawk Films catalog. But it was a trip to the Kansas Silent Film Festival back in 2000 that showed me first-hand how the films play with a large audience present, and how important that piece of the equation is (and continues to be) to the silent film experience. Sure, it's great that so many silent shorts and features have been restored and made available on digital media for home use or on YouTube. It's never been easier (and I include the silent era itself in that statement) to see not just the classics, but also obscure films and rare items that until now had been impossible to experience without trekking to the world's archives. However, if you don't experience the films as part of a large audience (and live music, but that's a whole other topic), you can't really say you've seen them. As the Kansas Silent Film Festival continues to show me (this will be my 15th year in a row), the large audience can make all the difference, whether it's with a well-established classic or just some obscure program filler. But back to the original point: this year's Kansas festival has a relatively high proportion of "rare" films, most of which I haven't seen before. Yes, there's 'Modern Times' (1936) in honor of the centenary of Chaplin's 'Tramp' character, and also Marion Davies in 'The Patsy' (1928). Otherwise, it's a real grab bag of shorts and features that I'm looking forward to experiencing, especially with an audience present. One added wrinkle this time around is that I have the honor of presenting a until-now-lost Mary Pickford film at this year's annual cinema dinner on Saturday night. I know what you're thinking: there must be a real shortage of prominent people in the vintage film world for me to be asked to do this. But the film was found in New Hampshire, so I have a geographic connection to it, at least. And so it will be my pleasure to present and accompany 'Their First Misunderstanding' (1911) as part of tomorrow night's dinner, which I'm told is sold out. Thanks to Bill Shaffer and everyone who helps organize and carry out this great festival for all the hard work that goes into making it look easy. For the other events today and tomorrow, the White Concert Hall at Washburn University holds maybe 1,000 people. So even if the dinner is at capacity, there's plenty of room at the screenings, and the more the merrier. So come join us starting tonight at 7 p.m. More info is online at the Kansas Silent Film Festival's Web site. See you there! even in a less-than-optimal environment? Three screenings in four days took me to a library basement, a college coffeeshop, and a theater where we had no choice but to show a sub-standard print of a silent classic. Well, whatever it takes to breathe life into this unjustly neglected art form, I think, as I load up the station wagon with my gear for yet another gig. But the results of this latest run have left me wondering if these films are perhaps hardier than I sometimes give them credit for. • Thursday, Feb. 20 brought me to Kelley Library in Salem, N.H., where I had to pleasure of presenting a Buster Keaton program as part of their film series. Like a lot of smaller libraries, its screening facility is not really a theater. Instead, it's a low-ceilinged basement conference room, with the projector on an AV cart and the screen about as big as a living room window. So maybe I don't give these pictures enuogh credit. I'm forever saying that in order to really understand and enjoy silent films, you need to see them in a theater, on a big screen, with live music, and with a live audience—the bigger, the better. Well, the Kelley Library basement conference room wasn't anything like a theater. The screen was smaller than many home entertainment set-ups, and two dozen people isn't exactly what you'd call a crowd. But still, Keaton worked! Even in less-than-optimal conditions, both the short and the feature produced gales of laughter. 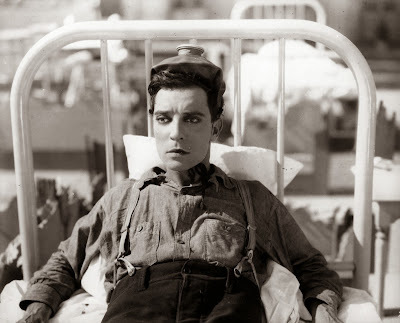 So I wonder: at what point does the environment take away from a silent movie? One of my first experiences with vintage film was at the Shakey's Pizza Parlor on D.W. Highway in Nashua, where 8mm prints of silent comedies were run on the walls. It was nothing like a theater setting: the "olde time" movies were treated as little more than moving wallpaper to distract patrons waiting for their orders. Yet it was enough to hook me. What would happen if you tried to show a silent film at, say, a Starbucks? Two days later, I got to investigate that very same question. The entrance to 'After Hours' at Northeastern University is down a steep flight of stairs. • Saturday, Feb. 22 found me as guest of the Northeastern University Film Enthusiasts Club, which included a screening of Harold Lloyd's great comedy 'Safety Last' (1923) as part of this semester's programming. In the back-and-forth that led to my visit, I was curious about the venue. 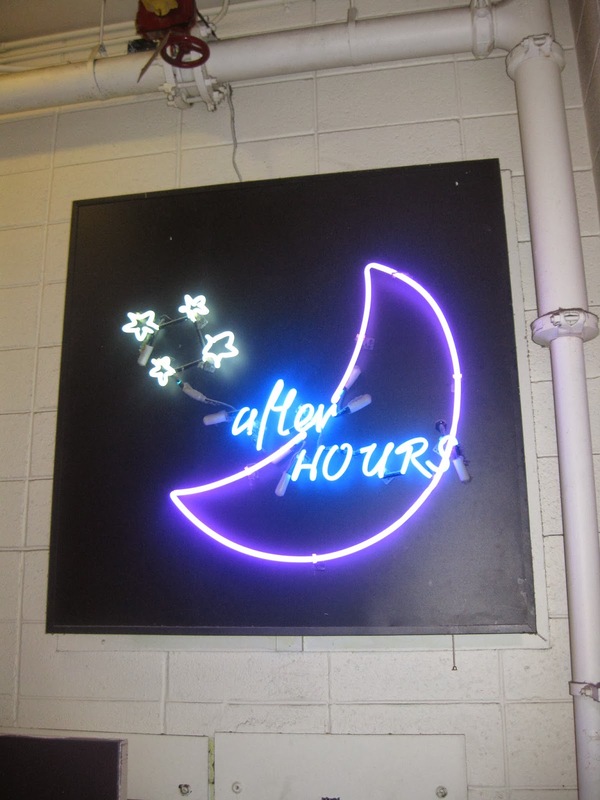 Rather than a theater or a lecture room, it was a coffeeshop called "After Hours." Part of the campus student center, it was a Starbucks that hosted various live acts on a small stage, with people free to come and go during the performance. Also, it would be in the afternoon. What? I wasn't sure this would work very well with a silent film. But organizers (all sweethearts, by the way) assured me all would be fine, so ahead we went. And thus I found myself navigating Huntington Ave. in Boston last Saturday, trying to find the right campus entrance to reach the venue. I found "After Hours" to be, yes, a quite busy basement Starbucks outlet packed with students poring over laptops. And over on one side was a stage and a screen, right next to an internally lit "After Hours" sign. I still had my doubts, but everyone was so nice to work with, I just went with it. The only request I made of them was to not feed the film to all the other video screens arrayed around the shop, as a silent film would be best served by the audience focusing on one screen rather than treating it like a baseball game in a sports bar. After plugging in my keyboard, all it took was a few notes over the house sound for the coffeeshop denizens around us to close their laptaps and beat a hasty retreat. Apparently this is a common occurrence. And then, yes, about two dozen students came together to sit in a couple of rows of chairs that had been set up. Introductions were made, lights came down, and off we went. Another strong reaction, even under less-than-ideal circumstances. And this was before Lloyd got as far as his iconic 'Safety Last' building climb. They were with him from the opening sight gag, where what seems to be a prison is revealed to be a train station. And the spell held throughout. So, in another experiment in what amounts to destructive testing, a well-made silent film prevailed. Perhaps they aren't such delicate and fragile creates after all. Too bad there isn't a Shakey's Pizza around anymore so I could really push the limits. In 'The Count of Monte Cristo,' John Gilbert (right) has learned much from fellow prisoner Spottiswoode Aitken, except perhaps the location of the prison barbershop. 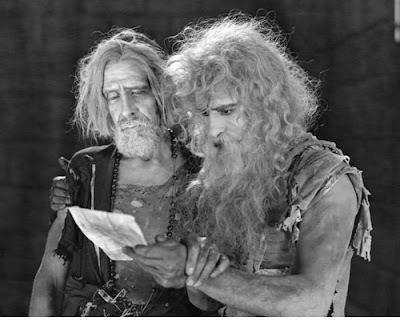 • Sunday, Feb. 23 saw no such limits being pushed as I did music for 'The Count of Monte Cristo' (1922) at the good old Wilton Town Hall Theatre in Wilton, N.H., where I've been accompanying silents for seven years now and which I consider home base. But wait! 'Monte Cristo' exists only in the form of a worn, choppy print discovered in the Czech Republic. It's been restored and is reasonably complete, but still looks nothing like it really should. Would this be enough of a barrier to limit audience engagement? Hardly! On Sunday, a good-sized crowd of more than 100 reacted to the film with abandon, loudly cheering the escape of Dantes from prison and then lustily reveling in his elaborate revenge. The print quality didn't seem to diminish this excitement at all. I must say, too, that this kind of film seems to bring out whatever strengths I have as an accompanist. It's a broad, sweeping drama, which allows you to take a few relatively simple themes or ideas and transform them in many ways as the story progresses. And it's also filled with what I think of as "revelatory" moments, where characters learn of long-held secrets and such and the audience gets to see the reaction. Music can really intensify these kinds of scenes, I think. So I felt in the zone for just about all of 'Monte Cristo,' with one strong moment after another: keeping the drama at a boil using a wide variety of techniques, bringing out the humor in how Dantes manipulates people in the latter half of the movie, and making the most of the film's few tender moments. It just felt good all the way through, and I love it when that happens. And it only occurs to me now that it all happened even though the print was sub-standard. So once again, the power of the art form transcended the limitations. And then I remembered a screening of 'Wings' (1927) a little while ago, where the folks running the projector couldn't get the aspect ratio right and the film had to be shown all stretched out. It didn't seem to mute the impact of the movie one bit! I'm not saying that you shouldn't make every effort to show these films as they were originally intended. But maybe I should stop worrying so much and give them a little credit for being hardier creatures than I sometimes think. After 'Monte Cristo,' I was delighted to be introduced to a 103-year-old gentleman who had attended the screening. Looking rather like Igor Stravinsky in his later years, the guy had enjoyed the show, and recalled that the very first movie he had ever attended was 'The Thundering Herd' in 1925. Wow! As time passes, you just don't expect to meet many people who were present when silent film was current coin. So it's a real honoor and delight to connect with anyone present at the creation, so to speak. I told him that we planned to do a series of animal films this summer in Wilton, and that I would gladly include 'The Thundering Herd' in his honor. Well, I've since learned that the 1925 version of this Zane Grey story is among the 80 percent of silent film considered missing. Rats! Silent film may be able to survive less-than-optimal presentation conditions. But in terms of benchmarks, you still do need the film itself in order to go forward. To pull together today's sermon, we cite a certain text by Marcel Proust. Before February completely slips away, let me quickly jot down a few notes about a remarkable run of screenings, if only to serve as an aid to my increasingly faulty memory. So many people to thank for their encouragement and support! I can't possibly name you all here but I'm grateful for everything that goes into making these screenings happen. Okay, here's a rap sheet, with brief thoughts about each. I hope these sketches will serve the same function as the "petite madeleines" did for Marcel Proust in 'Remembrance of Things Past,' in case I ever need to relive them in my dotage, which is closer than I expect. • Thursday, Jan. 30, 2014: Mary Pickford program at Red River Theatres, Concord, N.H. Hosted by Christel Schmidt, author and editor of 'Mary Pickford: Queen of the Movies,' a remarkable anthology of writings and images. Music for 'Their First Misunderstanding' (1911), the recently restored Pickford film found in a N.H. barn, and then 'Sparrows' (1926). Off night for me, possibly because of stress of organizing the program and just general rust after a month away in India. Audience of about 50; Christel was thrilled to sell some books! For me, worth it to bring Christel here for the films, and to just hang out some. • Friday, Jan. 31, 2014: Mary Pickford program at Somerville Theatre, Davis Square, Somerville, Mass. Similar program to day before but in 35mm, with prints supplied by Library of Congress. Great time introducing Christel to the Somerville crew; wild time running around Somerville and Cambridge to find a certain cable for her slide show that turned out not to be needed after all! Audience of about 100 enjoyed two shorts ('Misunderstanding' plus 'The Dream') and 'Sparrows.' Highlight for me: text message during performance saying something extremely nice. You know who you are! Afterwards, pizza with Christel and projectionist David Kornfeld. I just sat back and listened. Why can't all evenings be like this? • Saturday, Feb. 1, 2014: 'Way Down East' (1921) in 35mm at Somerville Theatre. Day 2 of a three-day weekend of silents kicking off the Somerville's Centennial Celebration. Somehow nailed a solid intro to the Griffith film by focusing on how he never got enough credit for knowing how an audience would react, something he mastered while working in the theater. Worth examining that in more detail someday. Audience about 100; print ran a little fast at 24fps, but as always, Griffith's narrative swept us along like Lillian Gish on those ice floes. Strong audience reaction, including lusty booing for Lowell Sherman's "Men are supposed to sow their wild oats" character. Strong musical material throughout, and it all came together; the highlight of the Somerville's triple-header, I thought. • Sunday, Feb. 2, 2014: 'Wings' (1927) in 35mm, matinee at Somerville Theatre. Final day of three-day weekend of silent film; matinee to avoid Super Bowl later. Print, newly struck from Paramount's recent restoration, had big problems, requiring heroic efforts from Kornfeld in the booth to make it work on-screen. This kinda distracted me and so took longer than usual to get into the zone, and found the war scenes definitely got away from me. Still, some very powerful moments for the audience of about 75, especially the post-crash embrace near the end and then Buddy Rogers giving back the toy bear. Wow! Audible sobbing from behind me. My post-applause wisecrack: "Anybody got some Kleenex?" • Tuesday, Feb. 4, 2014: 'The Mysterious Lady' (1928) at Manchester (N.H.) City Library. Nice turnout for pre-Valentine's Day screening of smoky Garbo flick about how romance and espionage don't mix. Saw this months ago but didn't preview as "training" for cold playing at Cinefest in Syracuse next month. I did remember that music played a big role, as Conrad Nagel goes undercover as a "Serbian pianist" and plays music from an opera at a key point in the plot. Confounded by rapid intercutting between Gustav von Seyffertitz's death and shots of dancing at wild party; wish I'd prepared the 'Trepak' dance from Tchaikovsky's 'Nutcracker' for maximum contrast. The good folks of Campton, N.H. send their best to someone who wished she could be on hand. Bill mollified the guy, or so we thought, until about a half-hour later when another guy comes in and tells us to stop. It's the dean of the business school; turns out we've been escalated. I tell him I'm in the middle of a performance and won't talk to him; Bill takes him outside and gets told that "academics have to take priority." Screening continues but Bill is apparently banned for life from Webster Hall. Wow! Glad I found out about this later or I would have stopped the screening and given this guy a piece of my mind. As it was, told students after the film that they ought to take a lesson from this: their lives would be filled with encounters with philistines and cretins, and they should always stand their ground and fight back. That's the quote of the year so far, anyway: "Academics have to take priority." This from a college administrator who ought to have some acquaintance of cinema as the defining art form of the 20th century! But I digress. • Thursday, Feb. 13 and Friday, Feb. 14, 2014:One screening of 'Sunrise' snowed out, while another goes forward. Latest big winter mess caused show scheduled for Thursday, Feb. 13 at Flying Monkey Moviehouse in Plymouth, N.H. had to be moved to Thursday, March 6. But 'Sunrise' happened on schedule on Feb. 14 (Valentine's Day: you can't stop romance) at Red River Theatres in Concord, N.H., where about 30 people attended. "Any first dates tonight?" I asked. (Answer: Nope.) Limited music preparation but held together. Used all string settings; intended to switch to full orchestra for storm sequence on lake but for some reason blanked on how to call up the setting, so storm turned out to be stringy after all. 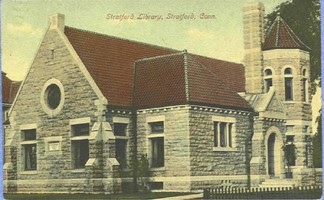 A 1909 postcard of the part of the Stratford (Conn.) where we screened 'Peter Pan' (1924). • Saturday, Feb. 15, 2014: Hauled myself down to Stratford, Conn. (three hours one way) for screening of 'Peter Pan' (1924) at local library. Postponed from before Christmas due to snow; two months later, snow again, but we went forward. Screening took place in library's stately original building; small turnout (weather?) but enthusiastic response. From the sound of the applause when audience is asked to save Tinker Bell by clapping, you would have thought 200 people were present! 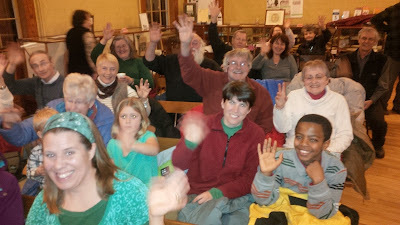 A great community for silent film, though, with many people eager to do more screenings around town. I may get to know Interstate 91 very well. P.S. 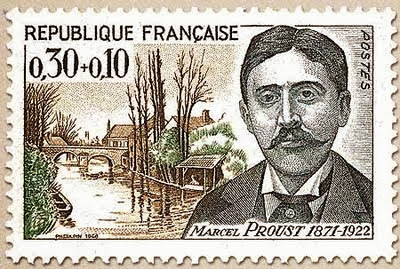 I just noticed that Proust (on that stamp) was only one year older than I am now when he died. Another reminder that time is marching on. Janet Gaynor and George O'Brien in 'Sunrise' (1927). Updated 2/14/14: The screening of 'Sunrise' on Friday, Feb. 14 at 7 p.m. at Red River Theatres in Concord, N.H. will go on as scheduled. Due to inclement weather, the screening of 'Sunrise' on Thursday, Feb. 13 at the Flying Monkey was postponed until Thursday, March 6. First, welcome to anyone visiting here who saw a profile of me that ran recently on New Hampshire Chronicle, a local TV news magazine produced in our corner of the world. The segment was actually filmed last year. At the time, I figured they must be running out of interesting people to talk to if they were interviewing me. And now I've entered the world of "evergreen" profiles, to be used to fill out a show when there truly is a dearth of original material, or if a segment falls through. On Monday night, I played second fiddle to a piece on New Hampshire residents still obsessed by the Beatles 50 years after they first appeared on the Ed Sullivan show. About the segment: I was thrilled to get the attention! However (and I don't mean to appear less than grateful), I was disappointed that they chose to run many of the film clips at speeds way faster than they're supposed to go. This reinforces the stereotype that silent films are absurd artifacts not to be taken seriously. Also, they played music that didn't go with what was on the screen, making things seem additionally random. So it reinforced my conviction that the only way to communicate the greatness of this lost art form is to recreate it as intended: with good prints, in a theater, with live music, and with an audience. Otherwise, it's very difficult to understand. The next local chance to experience this will be a pair of upcoming screenings of 'Sunrise' (1927), the great romantic drama directed by F.W. Murnau and starring Janet Gaynor and George O'Brien. Our shows are just in time for Valentine's Day, providing an opportunity for you and that special someone to do something, er, special. movie 'Sunrise' to be screened in N.H.
CONCORD, N.H.—Silent film on the big screen with live music returns to the Granite State with two Valentine's Day screenings of 'Sunrise,' (1927), an Academy Award-winning romantic drama. 'Sunrise' will be screened on Thursday, Feb. 13 at 6:30 p.m. at the Flying Monkey Moviehouse in Plymouth, N.H., and again on Friday, Feb. 14 at 7 p.m. at Red River Theatres in Concord, N.H. Admission is $10 per person for either show. The screening of 'Sunrise,' starring Janet Gaynor and George O'Brien, will feature music by New Hampshire silent film composer Jeff Rapsis, who will accompany the film live. Gaynor, a popular female star of the silent film era, won the first-ever Academy Award for Best Actress for her performance in 'Sunrise.' The movie took top honors in cinematography and was also recognized for "Unique and Artistic Production" at the first-ever awards. "It's a unique and special way to celebrate Valentine's Day," said Rapsis, who creates live original scores for silent film screenings around New England and beyond. 'Sunrise' tells the story of a young country couple (played by Gaynor and O'Brien) whose marriage is threatened by the presence of a woman from the city (Margaret Livingston) who convinces the man to abandon his wife. Will the young husband go through with a plan to leave his wife? Will true love overcome the obstacles of temptation and the promise of short-term pleasure? George O'Brien confronts temptation (in the form of Margaret Livingston) in 'Sunrise' (1927). 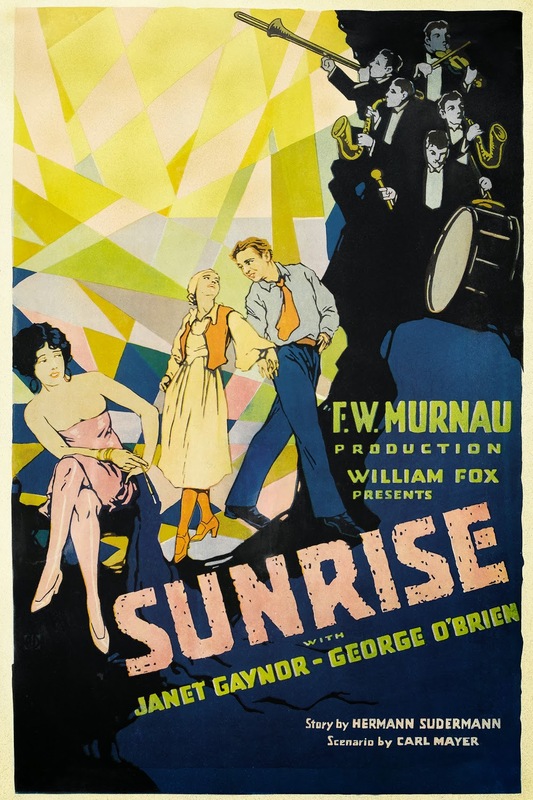 'Sunrise' was made by F. W. Murnau, a German director and one of the leading figures in German Expressionism, a style that uses distorted art design for symbolic effect. 'Sunrise' was made when Murnau was invited by studio chief William Fox to make an Expressionist film in Hollywood. The resulting movie features enormous stylized sets that create an exaggerated, fairy-tale world. The city street set alone reportedly cost over $200,000 to build, an huge sum at the time. Much of the exterior shooting was done at Lake Arrowhead, Calif.
Full of cinematic innovations, the groundbreaking cinematography (by Charles Rosher and Karl Struss) featured moving cameras and impressive tracking shots. Titles appear sparingly, with long sequences of pure action and the bulk of the story told in Murnau's signature style. The extensive use of forced perspective is striking, particularly in a shot of the City with normal-sized people and sets in the foreground and smaller figures in the background by much smaller sets. The story of 'Sunrise' is told as a visual allegory with few specific details. The characters have no names, and the setting is not named in order to make the tale more universal and symbolic. 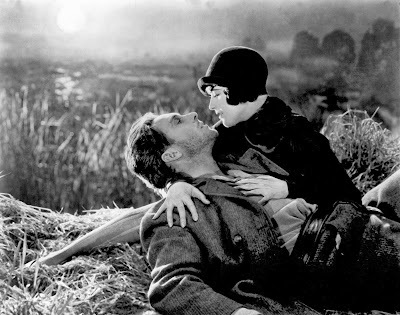 With a full title of 'Sunrise: A Song of Two Humans,' the film is regarded as one of the high points of the silent cinema. In 1988, it was selected for preservation in the National Film Registry of the U.S. Library of Congress for films that are "culturally, historically, or aesthetically significant." The Sight and Sound poll of 2012 for the British Film Institute named 'Sunrise' the fifth-best film in the history of motion pictures by critics, and 22nd by directors. Critics continue to hail 'Sunrise' as one of the best films of all time. "F.W. Murnau's 'Sunrise' conquered time and gravity with a freedom that was startling to its first audiences," wrote Roger Ebert in 2004. "To see it today is to be astonished by the boldness of its visual experimentation." The Flying Monkey Moviehouse and Red River Theatres include silent film in their programming to give today's audiences a chance to experience the great films of cinema's early years as they were intended: in restored prints, on the big screen, and with live music and an audience. Rapsis, who uses original themes to improvise silent film scores, said great silent film dramas such as 'Sunrise' used their lack of dialogue to tell stories that concentrated on the "big" emotions such as Love, Despair, Anger, and Joy. Because of this, audiences continue to respond to them in the 21st century, especially if they're presented as intended — with a live auience and live music. 'Sunrise' will be shown on Thursday, Feb. 13 at 6:30 p.m. at the Flying Monkey Moviehouse and Performance Center, 39 South Main St., Plymouth, N.H.; and again on Friday, Feb. 14 at 7 p.m. in the Jaclyn Simchik screening room at Red River Theatres, 11 South Main St., Concord, N.H. Admission is $10 per person for either screening. For more information about the music, visit www.jeffrapsis.com.